We like knowing more about lore of the area. We thought you might too. Here's a couple of questions we get asked a lot. If you have more to ask or more to share, let us know. HOW DID SMITH ROCK GET ITS NAME? While many think it's a myth, there is some evidence to suggest he did indeed die at the park, although more as an accident. According to 9 separate documents, Park Ranger Eric Iseman stands by this version. Settlers and prospectors pouring into shrinking native hunting grounds in the mid 1800s turned the area into a "no man's land." U.S. soldiers were assigned to protect Indians on reservations. They were mostly there to prevent horse stealing, as horses were valuable commodities. Chief Paulina, who chose to not join the Warm Springs Reservation, raided horses from the Indians that lived there. One night in October of 1863, Chief Paulina split his forces to elude the soldiers in preparation for such a raid. 30 of his men lay in ambush in the rocks of the now park area. When the soldiers pursued the horse thieves into the canyon toward the only river crossing for 20 miles, they entered a bloody battle that went on for an hour. During the fight, Private Volk Smith scrambled to the top of Smith Summit with no ropes, in his cavalry boots for a vantage point. He lost his footing and fell to his death. A newspaper article in 1867 in the Albany States Right Democrat credits Smith with "discovering" Smith's Rock. He had been traveling through the area while working for the Warm Springs Indian Agency. AND WHAT IS THE STORY OF SKULL HOLLOW? Yes, as the name implies, skulls found years ago at this now popular campground eight miles from Smith Rock are not a myth. Back in 1845 Stephen Meek, a wagon master and guide, led the ill-fated splinter group of wagons looking for a way across the Cascades. The water holes he had seen on previous trips had all dried up in the summer. 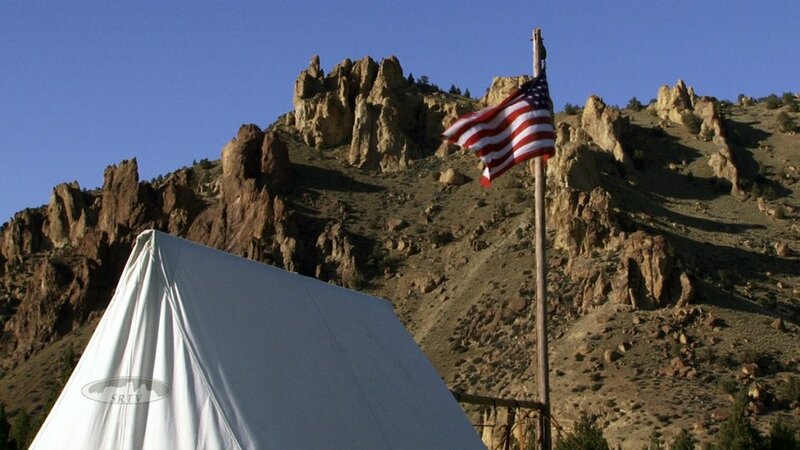 It wasn't until 19 years later in 1864, a year after the skirmish with Chief Paulina at Smith Rock, that soldiers came across the remains of a massacre at what is now Skull Hollow Campground. They found over 40 burned out wagons, china, and the bones of 200 settlers that lost their lives in a battle with the Indians in the hostile territory that was Central Oregon.